The Crown Jewel of Kawela Bay! 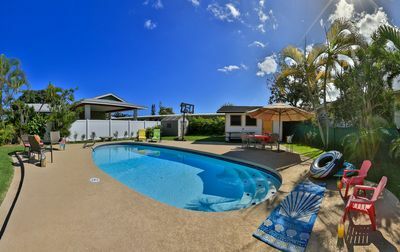 Experience the Real Hawaii! 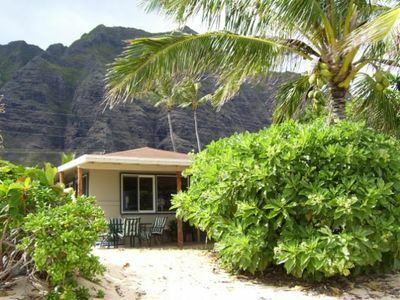 Our home , Hale Keo Keo was built in 1910, and is a charming historic home, on the famous North Shore of Oahu, Hawaii. 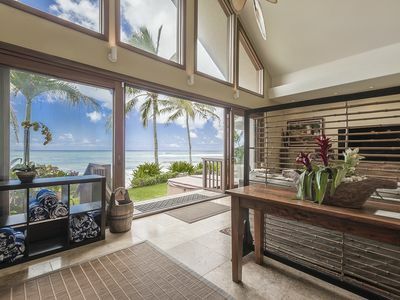 Our property, with two separate homes, sits right on the beach, on the private and beautiful Kawela Bay, 1 mile from the Turtle Bay Resort. 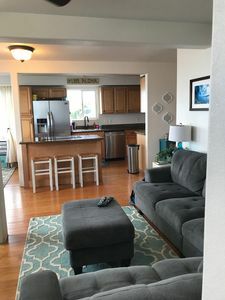 The property is quaint and charming, but also can sleep up to 18 people because there are two houses and a separate connected studio apartment...so it works great for families. This darling home, built over 100 years ago, is the Crown Jewel of Kawela Bay, as it sits right in the middle of the beautiful crescent beach,. Kawela Bay is calm, even in the winter months, as there is a protective reef at the entrance to the bay. We also have a nice surf break outside the bay that is perfect for kayaking, paddle boarding and surfing. However, the bay itself, is wonderfully calm and safe for children. The property consists of two homes, and a separate studio space, for your use. 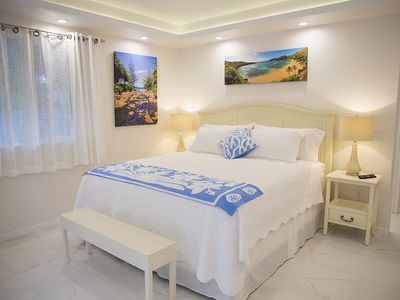 It is perfect for family reunions, as it will sleep many people.Cozy and cute, you will feel at home in paradise. 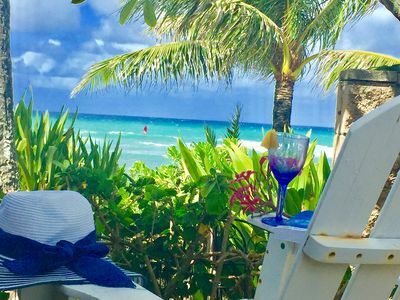 And once through the gates of this private community, you will leave the world behind and feel immersed in the colors of the turquoise water and baby blue skies. The large sea turtles come onto the sand every nite, to sleep right in front of the house. Yes, it's paradise! The original cottage is quaint and charming. 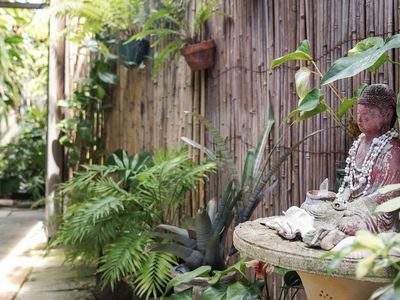 This home is the kind of home that is a treasure, and we feel blessed each morning when we watch the sun rise from our bedroom windows, and when we walk out on the front deck to greet the day. The main cottage has a master bedroom with a King size bed, another bedroom with two twin beds. About 30 feet from the original house is another cottage. This was built for our children and grandchildren, for when they come to visit. 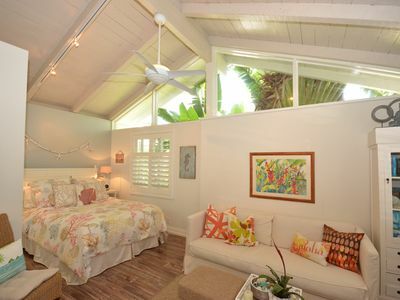 This cottage has 5 bedrooms, 3 baths. 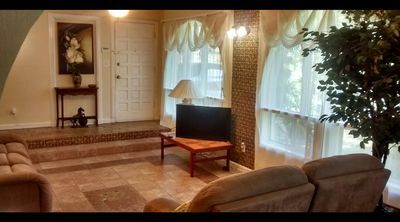 The upper floor of the cottage is where my art studio is located, and includes my large art table, perfect to sit around to play games. 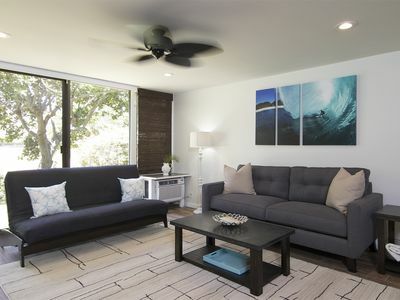 This living space is furnished with a sofa, chairs, a tv and a small refrigerator and microwave. There isn't a full kitchen....no stove or oven. This cottage is a great place for people to sleep, and for children to play. When our extended family visits, we always have our meals together in the main house. 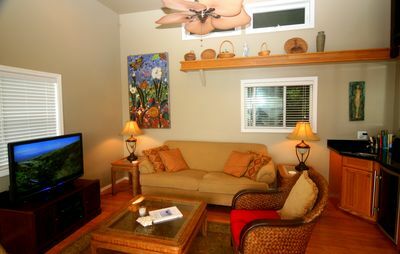 Below the main house is a studio living space that we call the "Surfer's Unit". It has a queen bed, living room area, kitchen, toilet, day bed and an outdoor hot & cold shower. 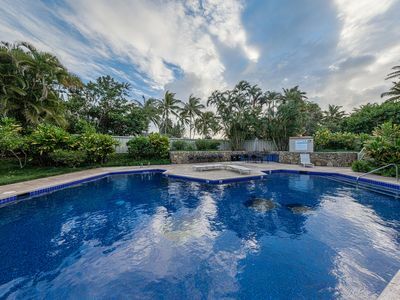 Kawela Bay is a private gated community. The North Shore is considered 'country' and on your drive to our home, you will pass black and white cows and sheep. When you enter the gate at Kawela Bay, you will turn down a country road and you will begin to feel like you have stepped back in time. Like you are coming home. Kawela Bay is as perfect a bay as you would ever wish for! It is 1/2 a mile long, in a beautiful crescent shape. The bay is safe for swimming, year around ( even during the large surf in the winter time ) as it is protected by a reef. You can float on rafts and commune with the sea turtles that call our bay their home. This bay is a perfect place to paddle board. We have two kayaks for your use, and plenty of beach chairs and towels. Just head down the steps and you're on the sand! 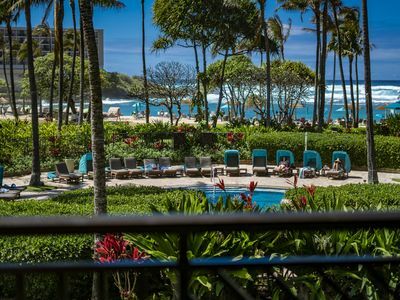 There is a fabulous forest of banyan trees just down the beach from the house that offers a beautiful walk to the Turtle Bay Resort, should you wish to have breakfast, lunch or dinner there, and watch the sunset while surfers ride the waves...or play golf on their famous golf course. Many movies are filmed here. The latest being The Hunger Games. It is not necessary to ever leave Kawela Bay, and you will find that the outside world just disappears when you are here, and only beauty and harmony exist. 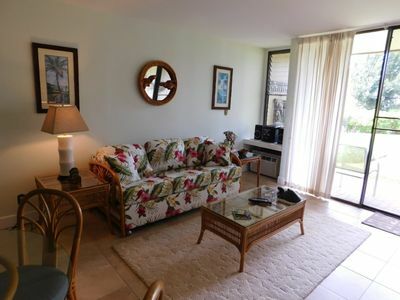 Kawela Bay is located on the laid back north shore of Oahu, between famouns Sunset Beach and the Turtle Bay Resort. 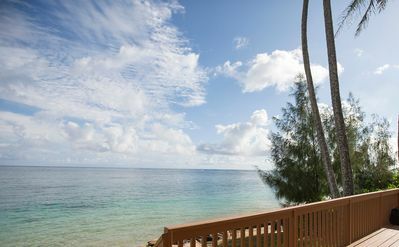 Kawela Bay offers calm turquoise waters, perfect for snorkeling and diving, and the only white sand beach on the North Shore open year round for swimming and sunbathing. 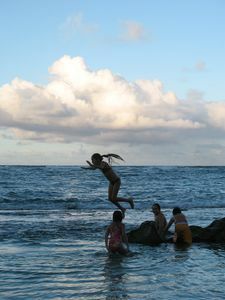 Many consider it the North Shore's best beach, and it was used for the movie "The Hunger Games" and the 'Magnum P.I.' television series. Kawela Bay is also home to many giant sea turtles. 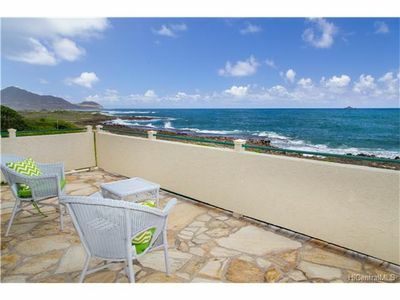 You can walk the beach all the way to Turtle Bay, or drive to Sunset Beach to watch the surfers. 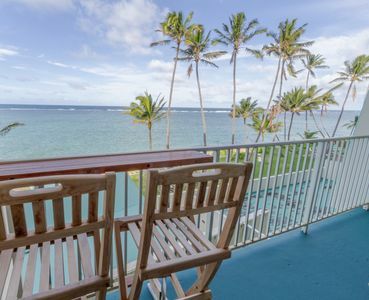 The whole north shore provides lots of 'old Hawaii' flavor, yet also offers shopping and fine dining. Other recreational activities in the area include golf, hiking, biking, horseback riding, windsurfing and sailing. 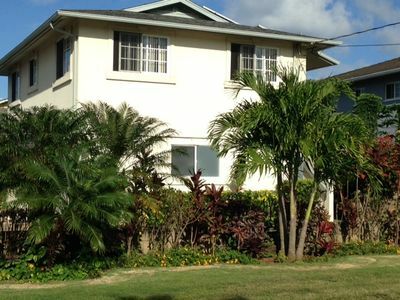 Haleiwa Town is just a 20 minute drive from Kawela, and Honolulu is approximately 48 miles away. If you have any questions, please send me an email, and we would be happy to send you more photos. Irma Jimenez is our on island manager and will be there to greet you upon your arrival. Until then, we send you sweet aloha breezes. 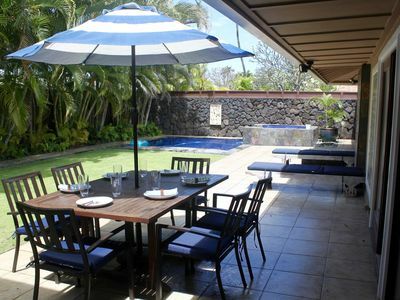 Hawaiian Dreams 4BR Ku'u Ahulili Beach House - We're ALL about the BEACH!